After three years of struggling with infertility, I'm so happy to share that I am now 17 weeks pregnant (!!) 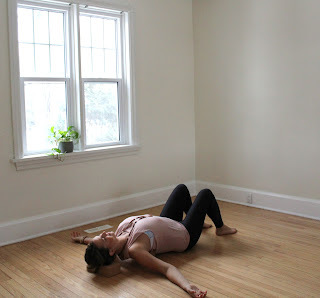 This process, of both trying to get pregnant and being pregnant, have undoubtedly had huge impacts on my yoga practice. In both instances a softening is required. For me, it meant no hot yoga, no inversions, and no super sweaty sequences: which are all inherently masculine. As you're preparing and creating life, it's time to soften into more feminine practices. Prone backbending: Heart opening poses done on the floor from your belly put too much pressure on your womb and leave little space for your growing belly. Inversions: While some women still practice inversions throughout their pregnancy, it is recommended not to do so, except for a safe inversion like legs up the wall that can be done through all three trimesters. 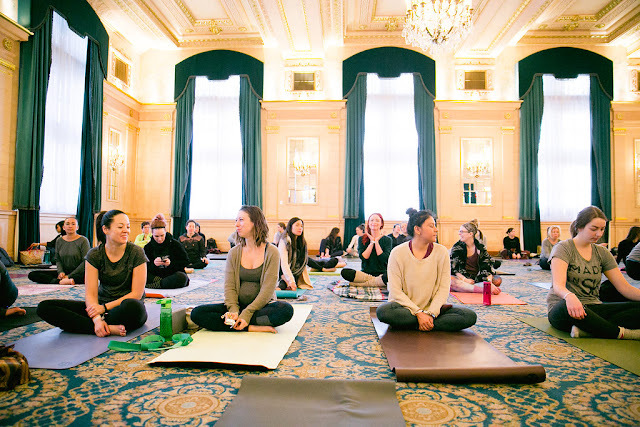 There are still plenty of options left for mamas-to-be to reap the benefits of practice while treating our bodies and our babies with loving kindness. Here are 7 poses I've found that integrate the soft femininity of open hips and an open heart required for mamas-to-be and hopeful-mamas. Open your practice creating by a solid foundation and honouring the connection to your womb. 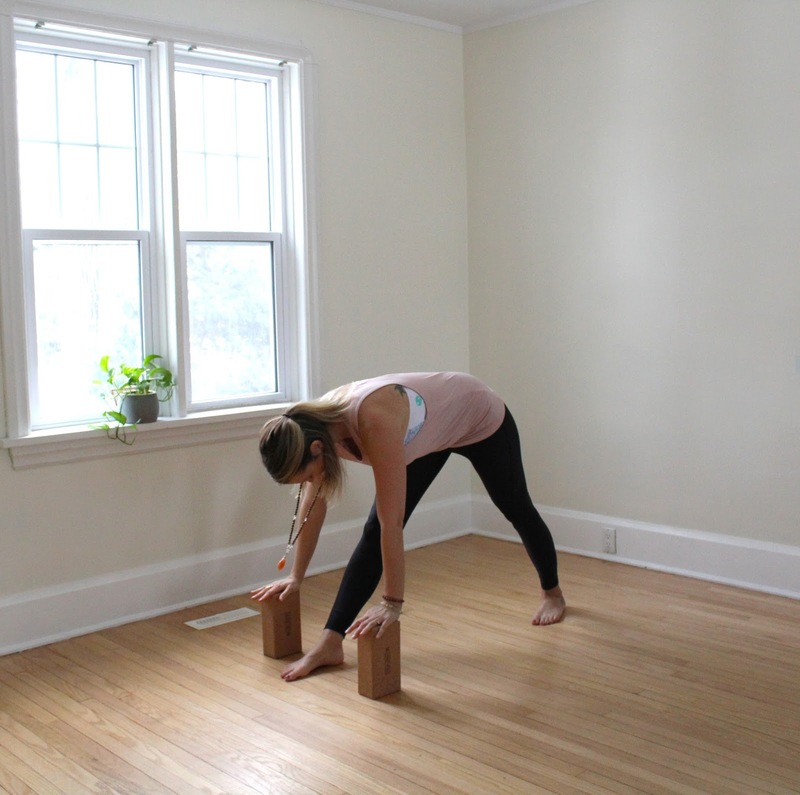 Stand at the top of your mat, feet hip distance apart, rooting all four corners of both feet into the ground. Activate through the legs and reach your tailbone towards the earth. Rest your hands on your lower abdomen. Breathe deep breaths deep into your belly, breathing love and gratitude into your feminine centre. Set an intention for your practice. This simple pose can be very powerful in both the conception and pregnancy phases. My favourite! This shape opens the hips and leaves space to add a gentle heart opener or side bend variation, depending on what your body is craving. From mountain, take a big step back with one foot and soften the back knee down. Keep the back toes tucked or untucked, depending on what feels better for you. Check to ensure your front knee is over the front heel. Sink down through the hips on an exhale and gently reach the finger tips for the sky on an inhale breath, expanding through the sides of the body. Remember to stay nice and low through the hips here to experience all the juiciness of this shape. Warrior woman. This is an active pose that, when done properly, is a grounding hip opener that radiates feminine power and grace. From low lunge, lift the back knee and plant the back heel into the earth - it should be parallel to the back of your mat and the front toes stay pointed forward, the front heel aligned with the inner arch of your back foot. Bend the front knee until it comes over the front heel. T the arms out, shoulder height, reaching out through the pinky fingers. 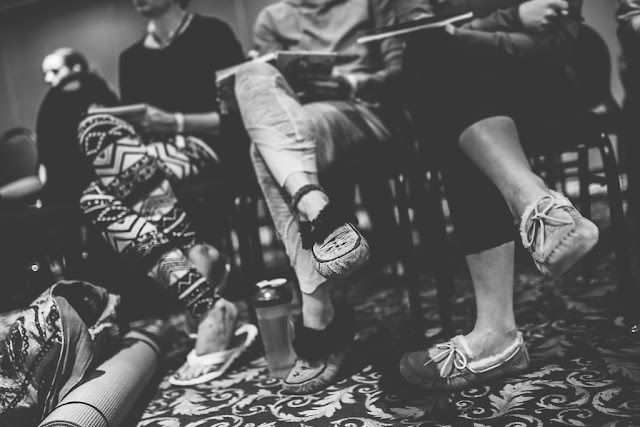 Bring your focus to your legs and feet: draw your heels in towards one another, feeling power rise through the legs up to the pelvis. Now lunge deeper. Hold for 5 breaths. Here's where we turn inwards. Forward folds are beautiful ways to open through the legs and also start to turn our focus to the more subtle feelings in the body. From Warrior 2, step the back foot in and turn it forward to a 45 degree angle. Square your hips to the front of your mat and fold forward over the extended front leg, keeping a soft bend through the front knee. Let the hands come to rest on the earth or onto blocks. Root down through the back heel to shift that hip forward slightly, while shifting the other hip back. Breathe in to lengthen the spine, exhale to fold in deeper. Here is a great place to close your eyes and be curious to the areas that feel dense or tight: can you soften more simply by breathing into it. This is the token mama-to-be shape. Goddess strengthens through the legs and inner thighs, while keeping the hips and heart open. From pyramid pose, turn all ten toes to the long edge of your mat. Spin the heels in and the toes out, sink down into a squat. You can keep the hands to the earth for a more restorative shape, or press the palms together for a more active pose. If taking the latter option, gently press the elbows into the inner thighs for a deeper stretch. Root through the four corners of both feet. Breathe deep and steep in the sensation. Hold 5 - 10 breaths. Mama bird makes space for baby bird in this big hip opener. To keep this shape soft and sweet, I like to slide a bolster beneath my hips: it helps to keep the hips level and makes keeping the upright, heart opening shape more accessible. From a low lunge, slide a bolster or pillow under your hips, shift the front foot to the opposite side of the mat, softening the outer edge of the foot to the earth. Press the shoelace side of the back foot into the earth to level out through your hips. Slide the shoulders down the back and release the hands to the earth or the bolster, soften through the hips and jaw. Big breaths make softening and staying patient here easier :). 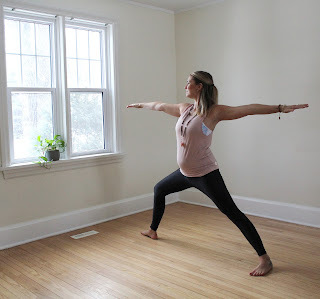 Motherhood is a total eclipse of the heart: a women's entire front body must expand to accommodate this new life and backbends are so beneficial in creating this space. From a seated position with your knees bent and feet firmly planted on the earth, place a bolster or 2 cork blocks (one at the bust line and the other beneath the base of the skull) behind you and lie back. If it feels ok, extend the arms out and turn the palms up to face the sky. Breathe into the front of your body, expanding into the heart, and its infinite possibility for love, with each inhale. Allow yourself to soften deeper with each exhale. Hold for 10 - 30 breaths. Always end your practice with at least a few minutes in a resting pose like savasana and a moment of gratitude for your beautiful body that is capable of incredible things. Watch the video above for inspiration on how to flow these shapes together into a fertility & pre-natal friendly practice. Infertility is now a big issues for lots of couple. You're getting pregnant is really a good news. Anybody can try natural fertility clinic Houston for best result. I read this article that was so amazing.it is very helpful for me.thanks!for writing.